Shruti's Blog: Fake it, but cake it! Festive times can be very vexing when for a variety of reasons we are trying to overthrow the (white) supremacy of the flour, butter, eggs and sugar quartet. Every time I almost succumb to the dictates of the big four, I think of my doctor (who incidentally reads my posts). How can I convince her that I may be cooking all these dishes, but I don’t necessarily eat too much or beyond reason, that it’s mostly low calorie stuff I cook on a daily basis, that I do keep away from the white venoms … sigh, leave it. My first born, my Sancho Panza in my culinary quests, is away on holidays in India, leaving me alley less in this season when everywhere out there is in festal food frenzy. I tried consoling myself by going through the photos of last year’s cake, kulkul and roce cookies and reposting some of the old posts, but that only deepened the longing for cake. Being at home on holidays didn’t help as well. 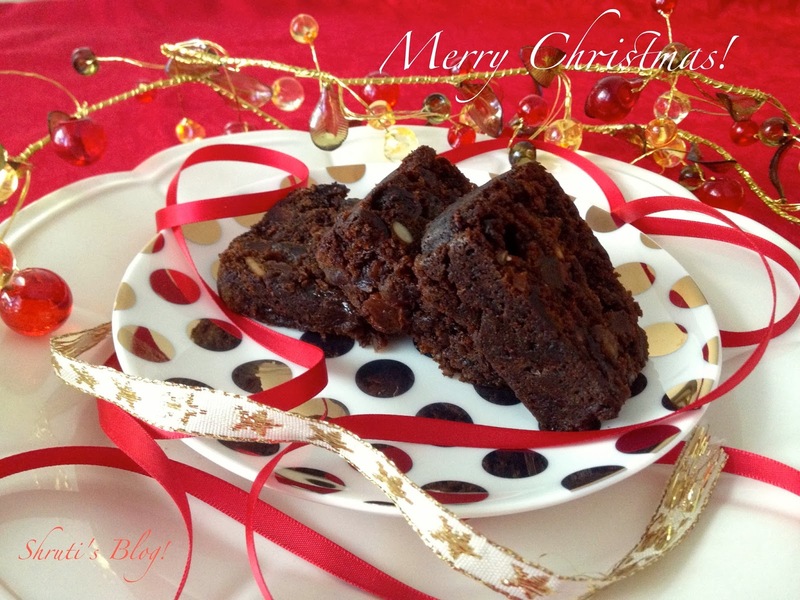 TV shows on every channel – yes even in Amharic and Samoan ones - feature Christmas food. I realised how right old Billy Boy Shakespeare in saying, “It is easier to forgive an enemy than to forgive a friend”, when even my alter ego Facebook betrayed me by graffiting its walls with Christmas goodies. Subjected to this tyranny of festive times, how on earth is one supposed to quash yearnings for Christmas cake? How can I bear to break the more than two-decade-old annual ritual of fruitcake and tea breakfasts in December? 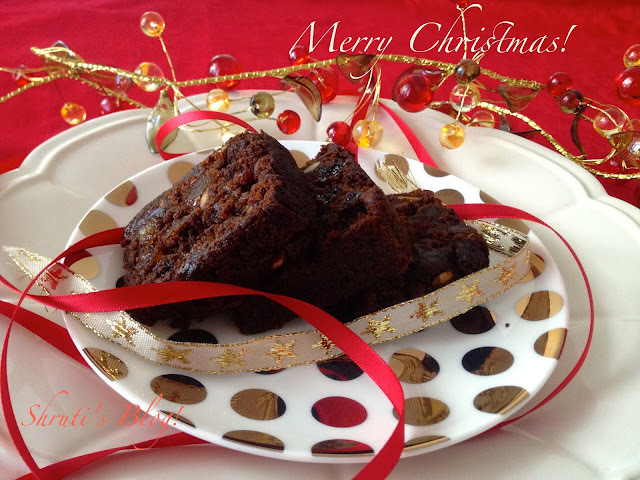 Who said all self-respecting food bloggers must bake a Christmas cake? Oh dear, am I a candidate for “Festivus for the rest of us”? No, no no – but then, the prospect of baking a cake was not only lonely, but also posed logistical problems. I hadn’t shopped for the ingredients, hadn’t soaked the fruit, didn’t have a recipe zeroed in on. Then again, my daughters who have always taken an ethical stand against factory farming and animal cruelty have recently started to make a serious attempt at veganism. That eliminated the dairy and eggs. Husband is allergic to alcohol and this year he’s around for Christmas, so there goes the soaking in the brandy. The youngest is an archenemy of raisins, orange peel, and cardamom, nutmeg and anything that makes a cake a fruitcake, so there was no point in trying to enlist her support. Under the magic spell of whole meal spelt flour, I was loath to use plain flour. However, in true spirit of Christmas, overcoming all obstacles was born this cake. Almost a fake cake - it seems to me - for it has been substituted beyond belief - no alcohol, white or brown sugar, eggs, plain flour, butter, yoghurt or milk. What is for real though, is that it is a delicious cake - not better than the original - I’ll be lying if I say that - but it is good enough to have it and eat it too! And I don’t have to worry about my doc reading this post. In a pan, add mixed chopped fruit, oil, coconut sugar, molasses, salt, water and orange juice. Bring the mixture to the boil and set aside to cool completely. Grease and line the base and side of a 22cm spring form cake tin with baking paper, making sure the lining is a few inches taller than the pan. In a large bowl, sift spelt flour with soda bicarb and baking powder. Add the cooled fruit mixture to the flour, followed by the nuts, zest and spices. Mix well with a long handled spoon. If the mixture is too thick, add some orange juice. Spoon into prepared tin and smooth the surface with the back of a spoon. Cut a thick brown paper bag to size and pop the cake tin inside. If required, tie the paper bag around the outside of the tin. Fold a sheet of baking parchment into a double square and cut a small hole in the centre. Cover the top of the cake with this paper, with a hole in the centre. Bake the cake on the lower shelf of the oven, look at the table above for baking times, and don’t open the door to peek at it until at least 3 hours have passed. Check for doneness with a skewer and bake a little longer if required. When done, remove from oven and leave cake pan to cool completely, then turn out and peel off baking paper. When the cake is cold, wrap it well in double greaseproof paper and store in an airtight tin. This will keep fresh for a few days in the fridge. I am going to try and freeze it till my fruitcake-loving daughter comes back from overseas.